Ignored by merchants, this plant is beloved by foodies. Rhubarb — sometimes considered a nuisance by peasants because of its abundance — can be found in a variety of both sweet and savory dishes. Although the traditional Russian drink kissel is usually made from berries, such as cranberries or black currants, there is another version made from rhubarb.This purple-stalked vegetable has long been an important part of Russian cooking. It is abundant and hardy and doesn’t require any special care. As a result, Russian peasants used it in soups, salads, pies and jam as well as kissel. In the 17th century, medicinal rhubarb was imported to Russia from Central Asia and China. The tsar at the time, Alexei Mikhailovich Romanov, held a monopoly on the rhubarb trade. During the reign of his son, Feodor III, rhubarb was transported from the Siberian city of Tobolsk to Moscow by merchants who were forbidden to sell is during the journey. The monarchy maintained the monopoly with only a few short breaks until 1782. There were a number of twists and turns in the foreign rhubarb trade in Russia. In 1656, Alexei Mikhailovich’s plan to sell rhubarb to Venice was a total failure, but only a few decades later, it was sold at a premium to English merchants as well as the Venetians. Garden rhubarb, however, was never considered to have much potential. Although it was healthy, it didn’t have the same properties as its Chinese cousin, and it was too common to be sold for profit. But it managed to win the hearts of cooks who appreciated its sweet-and-sour taste and its availability. 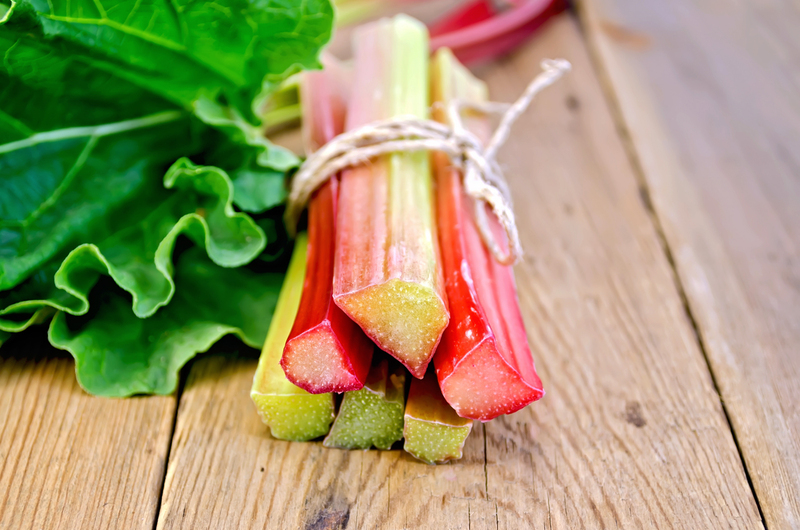 Rhubarb is rich in vitamins, minerals and enzymes and is extremely good for those with heart problems. It also helps to prevent strokes and blood cancers, it fights infection and to stabilizes digestion. Rhubarb can be eaten raw for a snack on the run or it can form the base of a dish, like this kissel. 1. Wash and peel the rhubarb stalks then cut it into small dice. Put the rhubarb into a pan, add sugar and cold water and cook for approximately 40 minutes, until the water starts to boil. 2. While the rhubarb is cooking, zest the lemon using a vegetable peeler. Add the zest to the pan. ½ tsp. of lemon juice may also be added. 3. Mash up the pieces of rhubarb. Traditionally, the pieces are passed through a sieve, but in this case, you have to remove them, then return them, to the pan. The easiest option is to use a stick blender to reduce the rhubarb to a smooth liquid. You can also add some cinnamon. 4. Dissolve the starch in a cup of cold water. Continue cooking the rhubarb for 5 minutes, adding the starch a little at a time. Stir the kissel steadily to prevent lumps from forming. 5. Wash the strawberries, cut them into pieces and add them to the kissel. Continue stirring the drink. 6. When the kissel becomes hard to stir, turn off the cooker and wait until it cools. It can be served hot or cold. Each portion can be topped with sour cream and decorated with mint leaves.